Hurricane Hermine made landfall early this morning in Florida with a furious mix of rain, winds and surging waves. 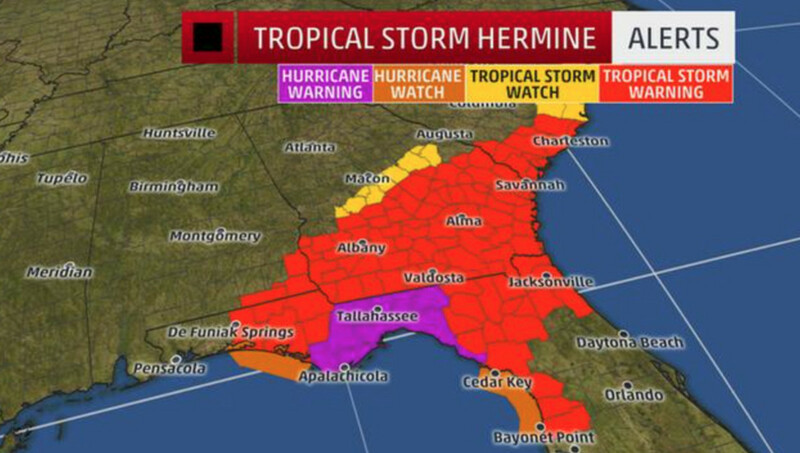 This graphic from The Weather Channel shows the areas Hermine is expected to affect. It weakened to a tropical storm after making landfall as a Category 1 hurricane. Hurricane Hermine made landfall early this morning in Florida with a furious mix of rain, winds and surging waves, then weakened to a tropical storm as it headed toward Georgia. Hermine had maximum sustained winds of 80 mph and was the first hurricane to come ashore in Florida since Wilma struck 11 years ago. It made landfall as a Category 1 storm in the Big Bend area, a part of the Gulf Coast where the state&apos;s peninsula meets the Panhandle, according to CNN. Heavy rain from Hermine will continue to affect a swath from Florida to Georgia and the Carolinas today. Tropical storm-force winds, isolated tornadoes and storm surge flooding also are threats in that area, according to The Weather Channel. 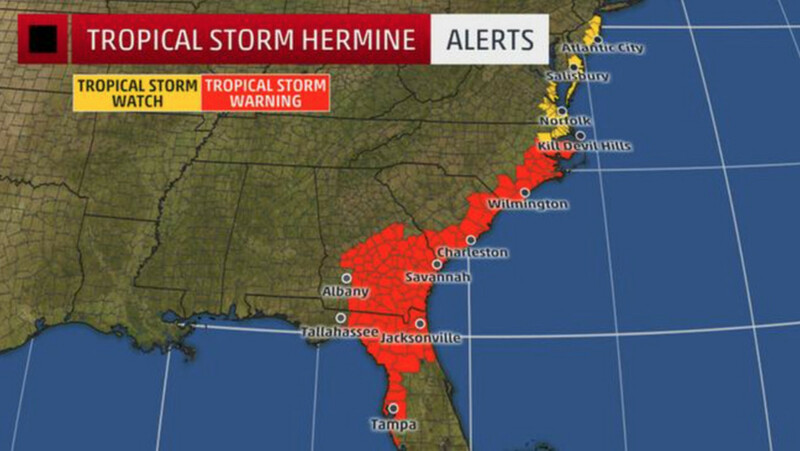 Tropical storm warnings continue in the Southeast, from parts of Florida to North Carolina. Hermine likely will become a non-tropical low by the weekend and hover near or off the Mid-Atlantic or Northeast seaboard, potentially resulting in strong winds, coastal flooding and other storm effects. A tropical storm watch is in effect as far north as coastal parts of New Jersey, Delaware and Maryland, as well as the Virginia Tidewater because the low may still have significant effects there. Confidence is growing that Hermine will be felt as far north as coastal New Jersey during the second half of the Labor Day weekend, the Weather Channel reported. Strong winds, coastal flooding, beach erosion, high surf, rip currents, heavy rain and flash flooding are possible. The tropical cyclone will be steered northeast around the west side of the Bermuda-Azores high-pressure system and will be pulled somewhat by a southward dip in the jet stream, or trough, moving through the Great Lakes and Northeast. The Weather Channel says the storm system could get trapped over the Northeast during the Labor Day weekend. That Great Lakes/Northeast upper trough exits into the North Atlantic this weekend before fully grabbing hold of the tropical system and taking it along. Upper-level high pressure building in behind and to the north of Hermine may trap the system for several days, encompassing much, if not all, of the holiday weekend.